It struck me a few days ago that I’ve never done a review for Romily Bernard’s FIND ME, and that is unacceptable. For some books, I may have let it go–but FIND ME is different. 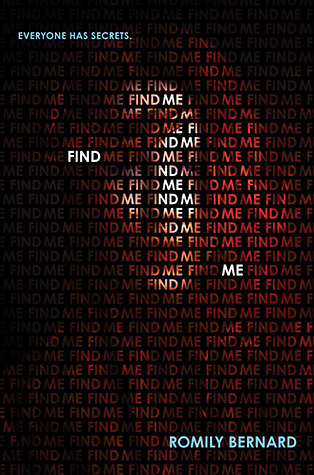 You need FIND ME in your life if you are a thriller lover or simply a mystery-inclined person. It isn’t the most heart pounding book, but it has amazing elements of suspense, a good mystery and plot behind it. Oh yeah, and it has GRIFF AND WICK. Griff and Wick are quite possibly one of my favorite couples ever, as well of two of my favorite characters individually. Griff isn’t your usual YA guy. He’s kinda nerdy, mostly humor and actually incredibly thoughtful when you get to know him. Wick is col and kick-but, but not in the way YA girls traditionally are. She’s a breath of fresh air. She’s realistic and by the end of the story, you know her but you want to know more.I loved Wick’s struggles, her self-conflict and how she reacts to every situation in FIND ME. I will admit–I didn’t love everything in this story, and not just love to hate, though I did love to hate how certain characters such as Lily, Bren and Lauren played out. One major thing I disliked was the ending. I had really wanted to see a little more closure. It felt like things tied together too quickly, though there were just enough loose ends left for me to WANT the sequel (which I really appreciate). Most questions are asked and then answered by the end of the book. Then again, it might be nice for people who don’t like dragging stuff out too much. All in all, I loved reading this story the first time and then rereading it again. It’s a truly entertaining novel, with a little bit of fun, a little bit of romance and an altogether great execution. While the pace could’ve gone by a little faster, FIND ME stuck out for me and it’s a book I will be rereading again as well as recommending. If you enjoyed this book or you simply don’t want any part in the fact that FIND ME is a series as well as a book about hacking and criminals, I would recommend PREMEDITATED by Josin L. McQuein. Great book with a premise a lot like this (and it’s a stand-alone). 4.3 stars.